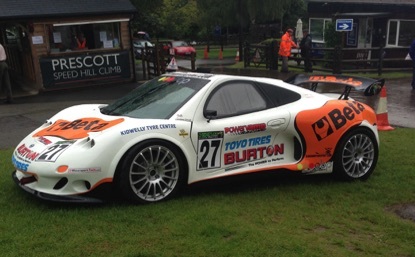 The Marcos Spirit 220 prototype made a special guest appearance at the 50th Anniversary of the Marcos Coupe at Prescott Hill climb on August 9th & 10th and created quite a stir. Already splitting the Marcos rank and file, just like the Mantula did back in 1984 and the TSO in 2004/5 when they first appeared, the Spirit also sparked debate about what is a 'real' Marcos? Both these earlier models are now accepted as Marcos’s even though the latter was the design of Damian McTaggart, previously of TVR and not from the drawing board of Dennis Adams. The debate will no doubt continue, but we should remember that throughout the automotive industry, owners and designers change and models come and go. Jaguar for example changed ownership in 1966 to BMC, later through other mergers to become part of the British Leyland Group. In 1990 Ford bought Jaguar and in 2008, Tata acquired the company along with amongst other concerns, Land Rover. During different ownership, the models were always Jaguars, not 'Ford XK220's or Tata F-Types, but Jaguar XK220 and Jaguar F-Type, and I certainly don't recall seeing a Tata Evoke or Jaguar Sierra! Now there is a new chapter to write about Marcos cars which hopefully will see the company rise again from potential obscurity to it's rightful position amongst the greats of British sports car manufacturers. The first Marcos prototype was actually built in Dolgellau, North Wales in 1959, and it seems fitting that the company should now return to its geographical heritage, even though this is now in the South and not the North. The Marcos Spirit 220 is designed and built by Marcos Cars Limited and Marcos Engineering Limited and 'Mr Marcos' himself, Jem Marsh, has been consulting on the project for some time. Tony Brown the new owner of Marcos Cars Limited, acquired the companies in 2010 and very soon afterwards, a new car saw the light of day. Despite rumors to the contrary, the Spirit is a ground floor up design and not simply a re-badged model that was part of another companies failed project. The Spirit 220 is obviously a totally new direction when considering the historical designs of the Marcos, mid/rear engine instead of front engined, but designs evolve and new models are born, just look at the Lotus 7 in comparison to an Evora or Exige. Enough of the history and comparisons, this car is all about the driving, and about driving fast. The car was at Prescott Hill Climb and we were fortunate enough for it to be allowed a couple of demonstration runs for those gathered there to see and I was fortunate enough to be given the opportunity to drive it. The Spirit was not set up for a hill climb course, still being equipped with its race circuit configuration, including the brakes. This would be interesting especially as the track was somewhat damp for the first run and it was my fist time in the car. I'd actually driven it for a few minutes the day before just to get a feel for the clutch bite and steering. The steering is unbelievable and the car is so well balanced that even at standstill you can turn the front wheels with ease. So, you might ask? Well, there is no power steering in the prototype and quite honestly, it doesn't need it. If I hadn't been told this before I drove it, I would have sworn after a brief tour of the paddock, that power steering was fitted. The interior is somewhat sparse but then this is a prototype all be it fully sorted, and a track car. There is actually lots of space inside, certainly more than an Elise, and the driving position is really comfortable. Front and side visibility was very good, rearward a little restricted but again this is the prototype and changes have been made to the production cars, with the addition of a rearward facing camera that will display on a small screen for the driver not just what your are leaving behind, but other technical data as well. The Prescott paddock is quite small and tight but the ease at which the car drove was really surprising and it would feel at home driving around town. Oh and the doors close with a quiet click! Sunday, track day, saw torrential rain in the morning but at around 11:30am the clouds started to break up and the track began to dry. There was an opportunity before the lunch break to give the car a quick shakedown and see what it felt like in the slippery conditions. I very carefully maneuvered the car out of the paddock making sure I could feel both the brakes and the bite point of the clutch. There's currently no connected hand brake and it would be somewhat embarrassing to stall the Spirit. A bit of ‘heel and toe’ was called for but I needn't have worried. Moving up the the start line I was reminded to take it easy just to get feel for the track by the start line marshall. Then thumbs up and it’s time to go. Cold tyres and damp track were not going to be helpful, but despite that I gave the Spirit plenty of revs and released the clutch. Very little wheel spin, more throttle and into second. Before I knew it I was into Orchard and still accelerating. I must admit I took it cautiously on this first run, I didn't want to embarrass myself by crashing, leaving the track, stalling it or breaking it, especially as there was likely to be at least one more run on offer. It was very much a sighting lap and the Spirit arrived back in the paddock much, as it turned out, to Tony's relief, and she'd not let us down. I felt I could have driven it for hours but the track was closed for lunch so I'd have to wait for the second run. There was a special cavalcade of Marcos cars just before the track was opened for runs in the afternoon and what a spectacular sight it was. Needless to say, the Spirit was to be the last car up the hill once the cavalcade had cleared, we nearly got it right, but that didn't effect the run. The car was warmed up before the cavalcade, sadly we were not going to get the chance to get the brakes fully warm, but at least the track was now fairly dry. Tony must have been a bit happier that the car was still in one piece, and with me driving it, as he said, 'give it some revs off the line this time' as I climbed into the cockpit. Getting in is actually a lot easier than some sports cars I’ve tried. I must admit I had a bit of a lump in my throat as I saw all the cars going off in the cavalcade in front of me. I followed the last car onto the course in the Spirit, stopping in the waiting area, still trying to get the engine fully warmed and a bit of heat into the brakes. Then the track was empty and we sat on the start line waiting for the all clear. The noise of the engine and fuel pump inside the car is quite loud but not offensive, mind you twenty laps of a circuit or half an hour on the road, might see me change my mind, but it is not really any noisier than my Marcos Coupe. Outside it's a different story, the car, is quiet to the point of spectators asking, 'has it gone yet'? Revs rising, the adrenalin was really starting to pump. Then the signal to go was given. Keep the revs up, release the clutch and the car took off, jumping sideways as we left the line. Worried, not in the least, even keeping the revs on and accelerating hard the Spirit just went exactly where I pointed it, towards Orchard bend. Burying the throttle and smoothly into second, the Spirit was accelerating very quickly, towards Ettores. I think we got into third before the bend, not sure as I was enjoying myself so much by this time that it was all a bit of a blur afterwards. Ettores can be a tricky bend at the best of times and in the wet, quite testing, a quick stab of the brakes confirmed that they were not at their best, still cold, so scrubbing off a bit of speed going down to second, ah I was in third, I pointed the Spirit at the bend and waited for the understeer. I needn't have worried, she went round as if on rails and accelerating out of the bend towards Pardon didn't even result in the tail wag I usually experience from the Coupe on the exit. Open the throttle and listen to that glorious V6, and accelerate hard. Pardon can be very demanding, as we’d already been told in the drivers briefing, and although I can take this easily in second in the Coupe, I was in two minds to drop the Spirit into first and be safe, but there was plenty of torque from the 3 litre V6, so taken a little wider than I would normally, the wheel spin on exit was in part down to the damp track, but no problem. The Esses were next and I I knew it would be slippery here. The Spirit never moved off line apart from when I found myself a little to far into the rumble strips and had to correct, but nothing that really caused a 'bum clenching' moment. This was after all a demonstration run, not a race so caution was paramount as the Spirit was not going home broken on my watch. A quick squirt up toward the final corner at Semi-circle, a blind off camber right hander. Get it wrong and you're off down the bank to the newly installed tyre wall and a long wait to get pulled out. So a little more cautiously than normal, we were round Semi-Circle for the final acceleration down to the finish line. All to soon it was over, and it was slowly down the escape road to the paddock. I wanted to go straight back out and do it again, and again, and again but sadly it was not to be and I parked the car in the paddock returning it to a jubilant and somewhat relieved Tony Brown, can’t think why! You've probably got the general idea that I loved it. Even with lower powered 3 litre engine, there's a 3.7 litre coming, the Spirit is fast, very fast. The positive light steering is a joy, making it nimble through the corners and not worrying the driver that she's not going to make the corner. I only wish I had had more brakes, but the car was in race track setup. Sometime in the next 12 months the Spirit will be run on Pendine Sands in South Wales in an attempt to break the speed record of the infamous ‘Babs’ standing at 174.56 mph. It is hoped it will be closer to 200mph by the time the runs are finished, I wish Tony luck. There’s also rumor of a one make race series, but nothing definite. Oh yes the name, Marcos Spirit 220, Tony also owns the Spirit Formula 1 team name, so it's keeping the name alive, and 220, well it’s got the ST220 in the back and there's that speed record attempt coming up. Is it wishful thinking? I must thank Tony very much for the opportunity to drive a superb car, it is most definitely a Marcos and I only hope it brings new blood and resumed interest in the Marque and of course the Marcos Owners Club, and can't wait for the next time!